A range of superb old-school cleans and drives - and an affordable price tag - make this one of the most tempting Supro combos yet. Excellent clean and classic-rock overdrive tones. One of Supro's most affordable amps yet. Higher headroom and higher gain available elsewhere. 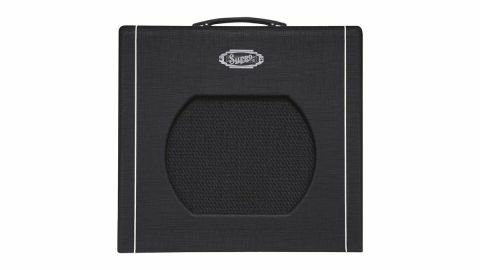 One of America’s most famous guitar amp brands and one of the world’s oldest, Supro can trace its origins way back to the 1920s. However, it was the Chicago era between 1935-68 that truly established Supro as the voice of the blues. Practically all influential blues artists from that era used Supro amps at one time or another, so it’s no surprise that many British blues rock pioneers adopted them too, with Jimmy Page reputed to have used a Model 24 combo on some of Led Zep’s early and most revered recordings. After fading into obscurity in the late 1970s, Supro was relaunched by effects guru and Pigtronix president David Koltai in 2013, and the new range has been a resounding success, blending vintage inspiration with modern manufacturing and that unmistakable Supro mojo. The recently unveiled Blues King 12 is typical of the new approach, with a lightweight, highly-resonant poplar cabinet shape that’s based on the 1950s Comet combo. Behind the control panel there’s a simple valve preamp and a pure class A single-ended output stage; meanwhile grafted into this vintage circuit is a cascaded FET overdrive section that adds independently footswitchable boost and gain for a wide range of distortion effects. There’s also a traditional spring reverb and a simple series effects loop, adding extra sonic flexibility to this very vintage-looking combo. The Blues King’s un-boosted sound is sweet and creamy at lower volume, transforming to fat and punchy when turned up, with a distinctive Supro edge. The power stage uses a single 6L6 to produce around 15 watts, which is more than enough for smaller unmic’d gigs, thanks to a truly superb loudspeaker that’s been specially designed to emulate vintage field-coil drivers. Add boost and gain to taste and the Blues King transforms into something way more potent, with a stunning range of vintage and modern crunch and lead sounds, enhanced by the smooth natural spring reverb. From biting Chicago blues to smooth jazz, or down-home country to searing modern rock leads, it’s perfect for smaller live gigs, backstage warm-up, home practice and recording studios too, thanks to impressively low noise levels. We used the Blues King with a variety of different guitars, including a PAF-equipped Les Paul Standard, a P-90-powered SG Special, a Strat loaded with lowish-output Duncan Alnico Pros and an Ibanez archtop, all of which sounded great, although we felt the best tones came from P-90 single coils and brighter PAF-style humbuckers. Best of all, though, the Blues King is one of the more affordable Supros, posing a significant threat to established small-combo market leaders. If you’re in the market for a small, portable and versatile valve 1x12, Supro’s Blues King should be top of your list.